The lady in the red dress with the violin is Alex Hills who said she had been celebrating her birthday until 5:30 am this morning; admirable stamina! There was also a guitar player. 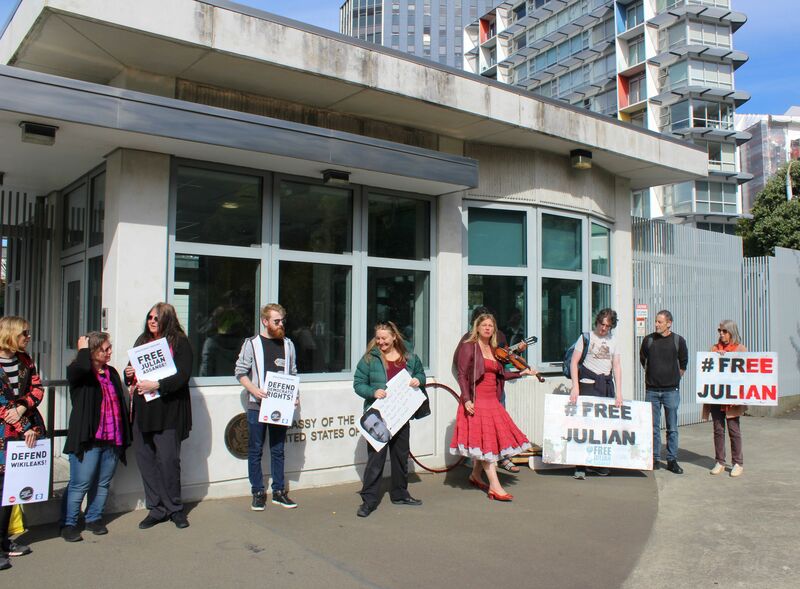 A small crowd gathered outside the American embassy at midday today to show and voice their support for whistle-blower and journalist Julian Assange of Wiki-Leaks who, as everyone knows, was dragged out of the Ecuadorian embassy in London last week by British police to face an extradition request from the U.S. Government. Co-organiser of today’s protest was Amanda Vickers of Waikanae, one of my supporters. Those who showed up had different perspectives, such as representatives of Socialist Equality, Social Credit and me, a Libertarian — but all had common causes: rejection of excessive and corrupt government, defense of people’s rights and freedoms, particularly Freedom of Speech, opposition to globalist agendas, and an end to America’s self-appointed role of world policeman. None present had anything positive to say about the Jacinda government — not one Labour or Green MP supported their pro-Assange petition last year, and it was clear from what the Socialist Equality man said that those on the political left are as concerned about what PM Jacinda is going to do next in her attacks on free speech as those on the political right are. As mentioned in the previous post on Assange, the irony in a lot of this is that in the 2016 U.S. Presidential campaign, the Republicans gave a lot of attention to Hillary Clinton’s 30,000 secret e-mails as Secretary of State and wanted them made public. Julian Assange duly obliged, to the benefit of Donald Trump’s campaign, but that may not help him much when he is sent to America. A live stream was made to the Free Assange Facebook page, and I held the camera phone briefly in that. 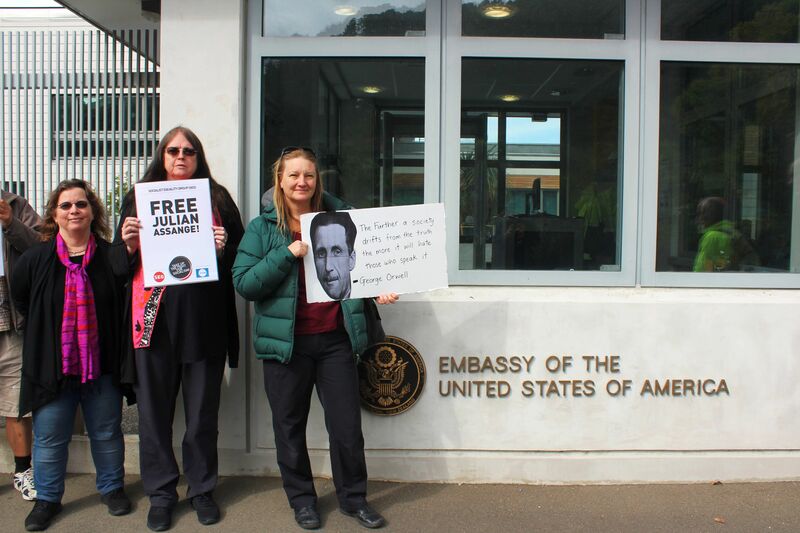 After the showing outside the American embassy the group marched along to the British High Commission for the same statements. A TV One News cameraman came along, so there may be an item about it on their news bulletin/website.